The European Parliament is an institution unlike any other, and the political groups of which it is composed face a unique challenge of building consensus among members from vastly different national contexts and political traditions. 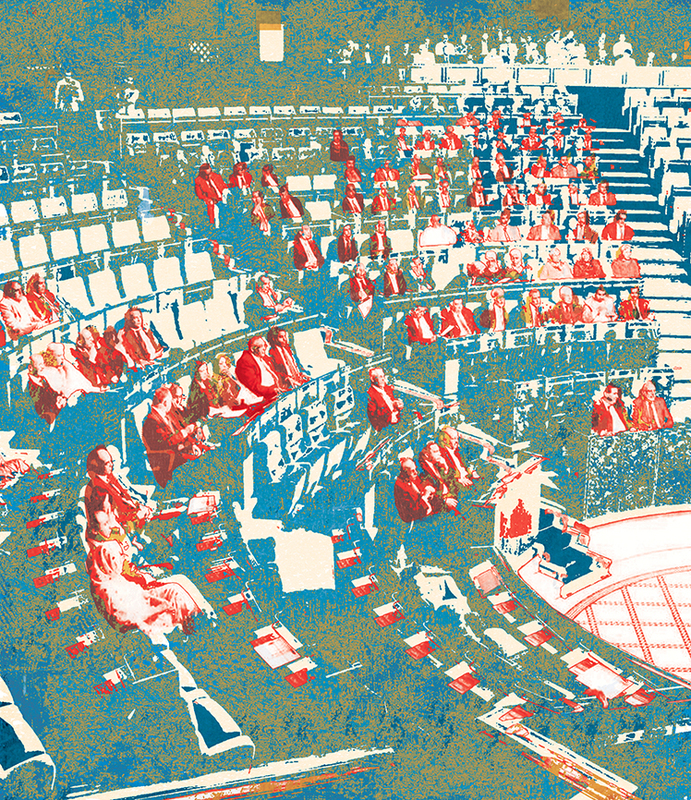 Against this backdrop of political diversity, shifting alliances, and multi-layered loyalties, VoteWatch sets out to make sense of these complex dynamics, by identifying the factors which promote cohesion or sow division, and monitoring voting patterns to ensure the Parliament is made accountable to the European citizens it represents. Green European Journal: Could you explain what VoteWatch does, its main methods, and some of the limitations affecting its work? Doru Peter Frantescu: At VoteWatch, we track how elected representatives vote on behalf of citizens in the European institutions. Occasionally we also track how citizens vote for their representatives at elections. We track votes in the Council of the EU, but we mainly monitor the votes in the European Parliament, where there are more votes and much more political diversity – with more political families and over 200 political parties. We collect the information on how each Member of the European Parliament (MEP) has voted on every vote that goes through the plenary, because that’s when we can systematically collect the information and where we have data since 2004. Information regarding the committees is much harder to collect, because it’s not very structured – each committee publishes it in a different way. Looking at the last 10 years, we can compare the European Commissions under José Manuel Barroso (2010-2014) with the current one under Jean-Claude Juncker, who claims to be leading a more political Commission. Were there major differences in the Parliament as a reflection of the Commission’s style and composition? Especially in the relationship between the two main blocks, the European People’s Party (EPP) and the Alliance of Socialists and Democrats (S&D)? There are some differences, but probably not as many as those who believe it is a more political Commission might expect. Especially in the first part of this term, while Martin Schulz was president of the Parliament, there was pretty solid cooperation between the EPP and the Socialists. Very similar to what we had seen before the 2014 elections. We measured the rate of cooperation between these two political families and found that it did not change much and in fact couldn’t have changed much due to numerical considerations, the two political families needed each other to pass most of the legislation. However, the two did disagree on some issues. For example, in 2015, when it was the first time the EPP and S&D disagreed on the Commission’s work programmes and voted against each other. From the political democratic point of view, it raises some questions when there is not enough political support in the Parliament for the short-term plans of the executive. So there were a few occasions on which these two collided and they had to try to build majorities on the centre-right and centre-left respectively. They continued to do so more after Antonio Tajani, the Italian EPP leader, took over the presidency of the Parliament and former S&D leader Gianni Pittella proclaimed the so-called breakup of the ‘grand coalition’, which never really was a breakup. But when it comes to issues such as the environment or migration, EPP and S&D do indeed have quite different views. This is interesting, because it means majorities are still based on issues and ideas and not purely on pre-agreed political majorities and arrangements. Yes, clearly, this is why we see the coalitions change from one vote to another. From one minute to the next you can have a very different majority. It’s very issue-based, we don’t have a stable government versus opposition system at the EU level. Which is relatively healthy but also poses questions as to the larger European EU democracy. Yes it does, but the system functions nevertheless. This is what can be done under current circumstances due to the way the executive is appointed. It is very difficult to have an executive of only one political colour as it is not appointed by the party that wins the EU elections but by national governments, which can be of different colours. So it is the best that can be done under current, less-than-ideal, circumstances. One of the founders of VoteWatch, Simon Hix, claimed that political loyalty in the European Parliament is moving from loyalty to national or Member State positions to political group and party loyalty. Does that stand the test of your observations? That MEPs are elected directly by citizens matters, and you can see that in the independence that they have from national parties and governments. They can oppose their governments and fellow national parliamentarians on key issues and the fact that they have a mandate of five years also helps as they don’t need to get re-elected very rapidly. Sometimes individuals MEPs effectively vote against the position of the national government, even if they come from the same party. It happens even in the case of the German conservatives who are one of the political factions that cooperate the most in the Council and Parliament. We have recently seen some of the leading German MEPs effectively voting against the position of Berlin. And of course the MEPs who belong to parties in opposition have much greater freedom than those who are in government to vote differently. That’s why the cohesion of some of the political groups is higher in some areas and lower in others, it depends on national circumstances. Does the loyalty of MEPs and the cohesiveness of groups vary across political families and does the stage at which they are in the mandate influence these factors? The subject which is being voted on matters a lot. Another factor is purely the good organisation of the political group in the Parliament. It takes some time to discipline a group but other than that it matters what topic or policy is being voted on. When it comes to migration or economic policy, which affect each country differently, the pressure to vote with the national political line is bigger, sometimes we see a clear South-North divide or an East plus South position against North. Having said that, overall it is amazing how the political groups manage to accommodate all these positions and manage to reach compromises. Europe is a very diverse union, culturally, socially, economically, and still the groups manage to find internal compromises and to come up with a common line in most circumstances. In fact, the biggest challenge to the political groups was in 2004, when the EU was enlarged, and it was said that this would bring so much diversity that the cohesion of political groups would be lost, but it didn’t happen. On the contrary, for a number of years it increased cohesion in political groups. How much of a reshuffle is the next Parliament likely to undergo with the likes of Macron’s En Marche, the Five Star Movement, and others shaking up the political landscape? The next Parliament is indeed likely to see one of the biggest reshuffles of the past decades. Across the continent we have seen big changes across the political spectrum. The centre has lost a lot of popular support to the fringes. This was already somewhat the case at the last elections in 2014, where the EPP and S&D both lost substantial numbers of seats, but it will be even more significant in 2019. Together they make up almost around 50 per cent of the current Parliament, but they will be far from this after the next elections. Then the British will leave, leaving a gap in some of the groups, the European Conservatives and Reformists (ECR) and the Europe of Freedom and Direct Democracy (EFDD). And with Macron coming, the Five Star coming –the latter potentially bigger next year than the former – there will be a lot of realignment. I think any move from Macron will happen after the elections, once the forces have been sized up. In any case we’ll see a more fragmented Parliament, with coalitions and consensus harder to build. In general, policy negotiations will take longer, both in the Parliament and in the Council where we have also seen increasing political diversity. After the electoral success of populists and the far right in Italy and Austria, we’re seeing some unexpected changes taking place. Exactly. Analysts and mainstream parties have hugely underestimated the power of new movements such as that of Macron in France, the Five Star in Italy, the Ciudadanos in Spain, and others. They underestimated, for example, the progress of the non-traditional forces in Austria. The only western European country where the centre has managed to resist is Germany, but even there only to a certain extent. Well anti-Euro and far-right Alternative für Deutschland in Germany are strong and could make further progress in the 2019 elections. Yes, and I think they would go (and fit) to the existing ECR political group in the Parliament. Could Viktor Orbán’s Fidesz move to the ECR to join the Polish, German, and other illiberal and authoritarian forces that are against the EU but not willing to get into bed with the extreme-right and fascistic forces of the likes of Marine Le Pen and Matteo Salvini? Yes, there is the possibility of a revamped ECR around the Polish Law and Justice Party. Certainly the Hungarian Fidesz would be their main ally in terms of policies and size. The question is whether Fidesz would want to leave the EPP. So far the EPP has shielded them against criticism from some governments and left forces regarding developments in Hungary. It would only make sense for them to move if the ECR were strong enough. The electorate has an appetite for something new. Many young people are looking for alternatives and, across the political spectrum, they want new parties and faces. Emerging political elites are frustrated too, as it is difficult for them to rise within the old parties, such as the EPP and S&D, as those are still dominated by what they perceive to be the old guard. So it’s much faster to build or join a new movement. It is fast-track politics, facilitated by the rise of the internet. You no longer need traditional communication channels, which works to the advantage of the new movements. So you can build your own movement, as Macron did very successfully. This is a political turning point and the main challenge traditional parties face. Some in traditional parties are still thinking, or rather hoping, that these movements will fade away and things will go back to ‘normal’. But I don’t think that will happen. What about the Greens in the European Parliament? One observation is that the Green group is the most cohesive in the Parliament. This is because there is an alignment in the views of members, and that they are in opposition in most countries also helps, because they face less pressures from their own governments and have more freedom. They have suffered a lot from, over the decades, moving to the left of the Socialists. Whereas the Socialists entered coalitions with the EPP, the Greens have remained in opposition in the Parliament for a long time without capitalising on opposition among Member State electorates. When looking at Eurosceptic forces, can it be said that their strength is in having a clear, coherent, and simple anti-European narrative while displaying big differences between one another at the national level? Yes, but it is important to remember that the Eurosceptic parties are Eurosceptic for different reasons. We have to understand the mindset of each, in order to understand why they are switching from being pro-EU to anti-EU, and that what we generally label Euroscepticism may refer to very different things, and the same goes for pro-Europeanism. Take the British Eurosceptics and the French Eurosceptics. The former believed the EU was regulating the market too much, while the latter, the Front National, believe the market is too open. The Polish are sceptical of the EU because it is trying to impose quotas for migrants. While the Greeks and Portuguese are sceptical because the EU is trying to impose austerity. The pro-European parties from Germany or the Netherlands see the EU as a common market. In the East or in the South you may be pro-European because of European funding and seeing the EU as a path to development. One final question: you conducted research on the cohort of young MEPs in the current Parliament, what are the main findings? We looked at the voting behaviour of MEPs under 40 years-old, compared to those over 40. We found that there are some differences, even when controlling for the groups (there are more young MEPs in left-wing groups than in right-wing groups). Overall, what is remarkable is that across the board younger MEPs are on average more in favour of greater public spending and less budget discipline; more in favour of an accelerated transition to renewable energy; more accommodating of immigrants; and are favourable towards more flexible migration policies. Also they are more likely to support an integrated defence capability to make the EU less reliant on NATO. Finally they are also more apprehensive, interestingly enough, about a faster integration of artificial intelligence and robotics in society. This sounds a bit contradictory perhaps – they understand it better as they grew up with it – but they worry about what it means for jobs. These findings are interesting, especially knowing the Parliament’s turnover is usually 50 per cent. That doesn’t necessarily mean they will be replaced with younger MEPs, but they might be. We may see these views gaining ground in the next Parliament. An interview with the Dutch historian on 10 years of crises and where Europe is headed now politics is back. An interview with the Pirate MEP on what Article 11 and 13 of the EU's proposed copyright directive could mean for internet freedom. As the EU acts on plastic pollution, industry lobbyists are upping their game in an effort to water down proposals.